Custom Western Saddles by Russ Fawson. Custom leather craft: holsters; gun belts; saddlebags; knife scabbards; rifle scabbards; belts; bridles; breast collars; pommel bags; bucking rolls; spur straps; spurs; leather covered canteens; and more. 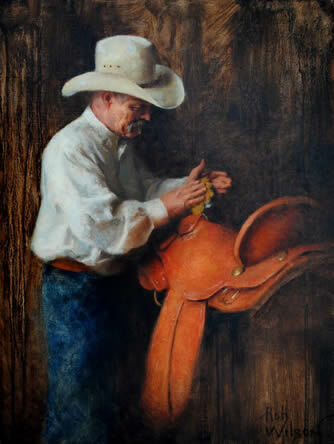 Custom handmade leather saddles, custom saddle designs, old west saddles, 1800s saddles, wild west replica saddles, old west reenactment saddles, custom cowboy saddles, custom show saddles, working cowboy saddles, parade saddles, custom saddle tooling, riding saddle, roping saddle, barrel racing saddles. If it can be made of leather, Russ can build it! Quality holsters designed to fit your needs.